This property perfectly captures the essence of modern day mountain living. 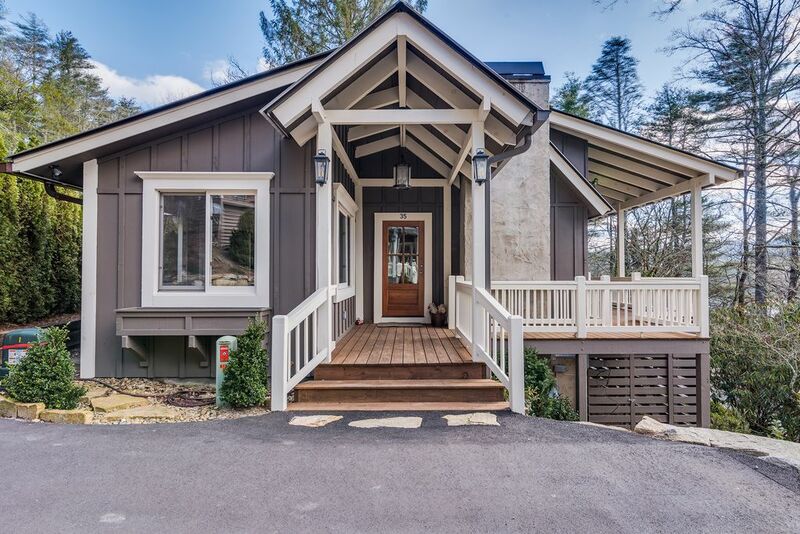 With great views over Cashiers Valley and the convenience of being within walking distance to the Village Green, this cozy cottage is the best of both worlds. Home boasts wide plank flooring, exposed beams, a metal roof, custom cabinetry, marble countertops, and more. Completely renovated recently, cottage has a light-filled open-concept floor plan with 2 bedrooms and 2 baths. We live in Atlanta and love being able to get to the NC mountains in just over 2 hours! We both grew up in NC and went to school at Chapel Hill. After years of living in other parts of the country we are happy to be back home. I loved this cottage the minute I saw it! So bright and open. And so convenient to restaurants and shops. Fully stocked with service for 12 and Calphalon cookware. Open to living area with counter and barstools for 4. Great spot to stay in-town Cashiers! Beautiful cottage in-town Cashiers...thoughtfully equipped with everything you need and then some! We thoroughly enjoyed our stay and would highly recommend this property to anyone traveling in this area. Rented this house to attend a wedding at High Hampton Inn. The location was perfect--about 5 minutes from the venue. Lots of other guests rented houses without realizing that they were sometimes 30-40 minutes from Cashiers up winding mountain roads. The house itself is beautifully furnished and just minutes from many restaurants and a full service grocery store. I would definitely stay here again! Fantastic rental! Location was in the middle of everything. Layout was perfect for four. Everything needed for a perfect stay. Covered porch for enjoying afternoon showers. Best lighting I have seen, period. Great design. We loved this cozy cottage. In fact, it may be our new favorite place in Cashiers to stay. As the title suggests...this property is wonderfully comfortable. We stayed five nights, wished we could stay five months. The furnishings are first class...you really feel like you are staying in a trendy resort property. Everything is new and so tasteful, it's as if you are staying in a decorators own personal home. WiFi worked flawlessly as did the wonderful gas fireplace. Great TV and well equipped kitchen. The owner welcomed us with a call and email and was available as needed when we had a question or two. We have been coming to Cashiers for 40+ years and love the in town convenience of this property. One note though...this is not a property up a mountain with a view. For us, that is a plus because we love being right in town...but you should know there is some noise from time to time from the road below. I could go on and on since our stay was so perfect...we loved this property and cannot wait to visit again. Cheers for the cozy cottage! We had a great time at the cottage. Perfect size for family of four, daughters 16&14. Very clean. Great location for us as this was our first time in Cashiers. Laura was very accommodating to our needs. Close in distance to waterfalls, trails, Lake Grenville. Excellent restaurants within two to ten minutes. Family favorite was Winslow’s Hideaway. Would definitely return to this Cottage. Loved our stay and working with the owner. The cottage is beautiful and nestled in a great location with access to everything. All details provided for and then some.